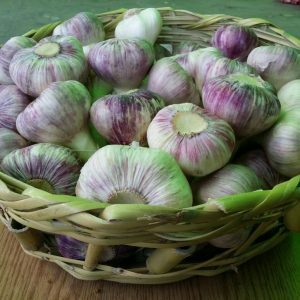 The Fresh Garlic is one of the important product in Vege Land Company, We are well—Known for Exporting Fresh Garlic White and Rose. Vege Land Have Farms in Delta — Minya — Bani suef. The Harvest Season Starts on 15-2 lasts until 30-4 . The Fresh Garlic sort is ( Rose Garlic or China Garlic ) one Sort and ( White Garlic or Baladi ) one Sort. Nets ( 5 kg , 7 kg , 10 kg ) , Carton ( 5 Kg) , Plastic Kiste ( 5 kg , 7 kg ) 5-Size We Can Provide you with sizes From 3.5 cm to + 6 cm.